The First CHOice® Medium is a high performance cell culture medium optimized for mammalian cell lines. In combination with CHOice® Feeds it has been optimized to boost the cell growth and productivity in batch, fed-batch and perfusion processes. 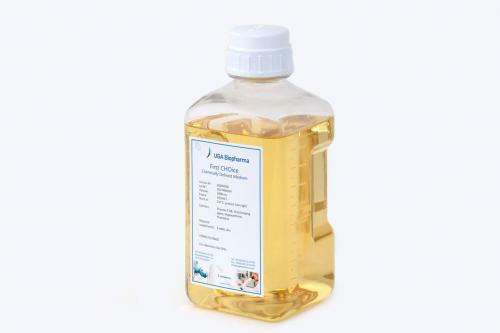 The completely chemically defined, animal component and protein free First CHOice® Medium has been developed in close cooperation with customers using CHO-S, CHO-DG44 and CHO-K1 cell lines in order to minimize stress-related metabolites such as lactate and ammonia. In this way high product quality and cell viability is guaranteed during all cultivation phases. First CHOice® Medium with and without HT is available. A product information sheet is available. The completely chemically defined, animal component and protein free First CHOice® Feeds are optimized to be used in combination with the First CHOice® Medium using CHO-S, CHO-DG44 and CHO-K1 cell lines. First CHOice® Feed Alpha and Feed Beta is available.